People come from all walks of life, and this means it’s sometimes challenging to identify our commonalities. But here’s something many of us share: We’re not getting enough sleep. Millions of Americans suffer from something called sleep deprivation, a condition in which a person doesn’t obtain enough sleep to feel well rested and function at their best. According to a health survey from the Centers for Disease Control and Prevention, anywhere between seven and 19 percent of American adults report feeling sleep deprived every day. That means as many as 61 million people are zombie-walking around the United States at any given time. This is bad news, because adequate sleep is critical for sustaining our physical health, mental wellbeing, and overall quality of life. The good news is there are plenty of strategies for coping with sleep deprivation. Here’s what sleep deprivation is all about—its symptoms, causes, and risk factors—plus medical and natural treatments for sleep deprivation that can help you feel like a human again. As the term suggests, sleep deprivation happens when someone is deprived of sleep—in other words, they don’t get enough sleep to enable them to feel alert and for their bodies and minds to function optimally. Sleep deprivation is not a disease. Rather, it usually results from other conditions such as illness, insomnia, or stressful life circumstances. We’ll touch more on the causes of and risk factors for sleep deprivation in the following sections. The amount of sleep required to avoid sleep deprivation varies from person to person. Most adults need to sleep for approximately seven or eight hours each night to avoid being sleep deprived, but some adults may find they need more or less sleep on a regular basis. Teens and younger children have even higher sleep requirements. Sleep deprivation may stem from a variety of causes, but its symptoms are fairly consistent. Children, teens, and adults all experience negative symptoms when they’re deprived of sleep. In the following sections, we’ll explore the causes and consequences of sleep deprivation. What Are the Sleep Deprivation Stages? After 24 hours without sleep, a person is likely to suffer from impaired coordination, a higher risk of accidents, difficulty remembering things, diminished attention span, and reduced decision-making abilities. Research suggests these diminished cognitive capacities are equivalent to those of a person with a blood alcohol content of 0.10 percent. After 36 hours without sleep, a person’s body becomes increasingly stressed. This results in high levels of inflammation in the bloodstream; if this inflammation is chronic, it significantly increases the risk of high blood pressure and even cardiovascular disease. Hormones will also be affected at this stage, which can result in mood swings. After 48 hours without sleep, a person’s body will continue to exhibit signs of extreme duress. It’s likely to start experiencing “microsleeps,” in which the body shuts down for a few seconds before the person jolts back awake—often feeling highly disoriented. These microsleeps are not unlike a drunk person’s blackouts. It’s also likely that physical coordination will further deteriorate during this stage. After 72 hours without sleep, a person will experience severe cognitive impairment in the form of reduced concentration, motivation, capacities for perception, and other higher-level mental functions. Emotional agitation and heart rate both increase, as does the risk of being in an accident. Note that if you experience any of the above or below symptoms, please see a healthcare provider for the best course of action. Information on the internet is not a valid replacement for qualified medical advice. Even if your sleep deprivation never reaches the 72-hour mark (and let’s hope it doesn’t! ), you’re still likely to experience some unpleasant symptoms after a night or several without adequate sleep. We’ll explore those symptoms in the following section. These symptoms don’t just arise in a vacuum. They result when a variety of potential contributing factors deprive a person of sleep. We’ll explore the possible causes of sleep deprivation in the following section. Also on Sleepopolis: Our full Loom & Leaf mattress review. Illness. If you’ve ever had the flu or a common cold, then you know illness can keep you up at night. This, in turn, can provoke sleep deprivation. Sleep disorders. A number of sleep disorders may contribute to sleep deprivation, including insomnia, sleep apnea, snoring, and restless leg syndrome. Family obligations. If you’ve ever shared a house with an infant or toddler, then this needs no explanation. Babies and young children rarely sleep through the night—and that means their parental figures don’t either. Same goes for anyone who’s taking care of a sick relative. Poor sleep hygiene. Personal habits such as drinking caffeine in the hours leading up to bedtime, smoking cigarettes, failing to manage stress, or exercising right before bed can all make it less likely that you’ll fall asleep quickly enough to enjoy adequate amounts of sleep. Poor sleeping environment. If your bedroom is noisy, bright, or excessively hot or cold, that’s going to inhibit your ability to sleep through the night. Same goes for anyone who sleeps next to or near a person who regularly snores in their sleep. Work schedules. Work can contribute to sleep deprivation in several ways. For example, working long hours may inhibit a person’s ability to sleep for long enough each night. Shift work can also provoke sleep deprivation because it’s harder to train your body to a consistent sleep schedule. Certain medications. Some medications can make it harder to fall and stay asleep. These include some of the prescription drugs used in the treatment of health conditions such as ADHD or epilepsy. Certain medical conditions. A number of health conditions may interfere with a person’s ability to fall and/or stay asleep, thereby contributing to sleep deprivation. These include acid reflux, heart disease, high blood pressure, diabetes, Parkinson’s disease, depression, hormonal imbalances, thyroid disorder, and other chronic illnesses. Pregnancy. The hormonal and physiological changes associated with pregnancy may interfere with a person’s ability to get a good night’s sleep, which can lead to sleep deprivation. Lifestyle choices. Some people enjoy hitting the club, watching late-night TV, or otherwise staying awake into the wee hours of the night. While these are personal choices, they can add up to some serious sleep deprivation if the alarm still goes off early the next morning. What Are Some Risk Factors for Sleep Deprivation? 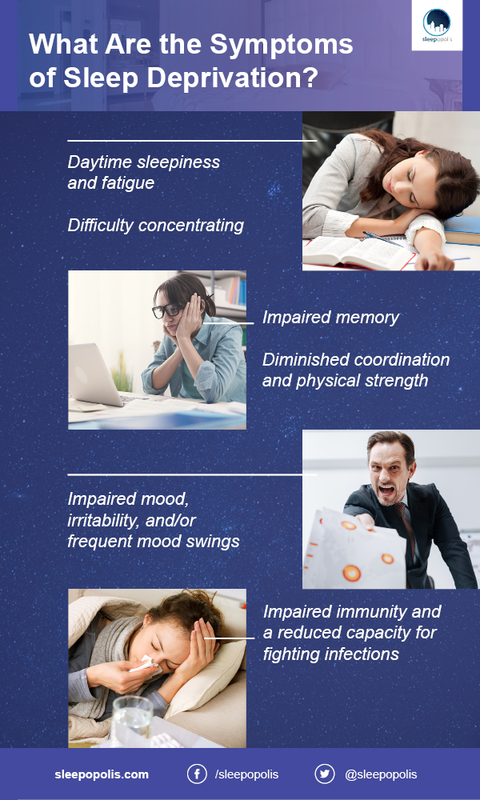 If you have any of these risk factors and/or you’re experiencing symptoms of sleep deprivation, then it’s a good idea to chat with a healthcare professional. They’ll be able to help you identify your potential risk factors and develop a plan for coping with those issues before they provoke a major case of sleep deprivation. 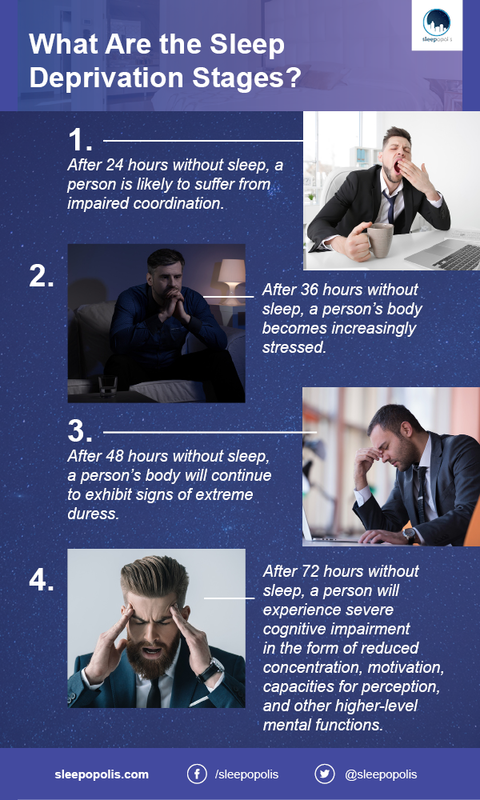 Risk factors for sleep deprivation aren’t a guarantee that you’ll become sleep deprived, and the sooner you address these risks the better equipped you’ll be to stave off sleep deprivation. Who Is At Risk for Sleep Deprivation? How Does Sleep Deprivation Affect Your Body and Mind? No matter its cause, sleep deprivation can negatively affect your health in a number of ways. Symptoms and impacts will be unique to the individual. 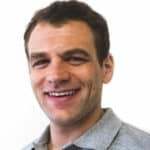 As noted in the “symptoms” section above, short-term bouts of sleep deprivation may result in impaired coordination, diminished physical strength, impaired immune system function, and impaired cognitive function, among other detrimental effects. It increases the risk of serious health conditions such as cancer, diabetes, heart disease, high blood pressure, stroke, and overall mortality. It increases the risk of severe mood swings, anxiety, depression, and other mental illnesses. It increases the risk of developing sleep disorders such as insomnia, narcolepsy, and sleep apnea. It increases the risk of injury or fatality in car or workplace accidents. Driving while fatigued is linked to tens of thousands of car crashes every year. It impairs function across many of the body’s systems, including the cardiovascular, central nervous, digestive, endocrine, immune, musculoskeletal, and respiratory systems. Because it impairs immune system function, sleep deprivation can increase the risk of infection and illness. It exaggerates the effect of alcohol in the body, meaning a sleep deprived person who drinks will find themselves more affected by alcohol than a person who is not sleep deprived. It increases the likelihood of weight gain or loss. In addition to these physical and mental health effects, sleep deprivation can also impair your workplace performance, inhibit your social life, decrease your motivation to stick with an exercise routine and other goals, and cause tension in your intimate relationships. Bottom line? Chronic sleep deprivation has a serious impact on a person’s quality of life. If you’re experiencing any or several of the symptoms of sleep deprivation—especially if those symptoms are chronic or long-term—it may be time to consult a doctor. They’ll be able to assist you in the diagnosis of sleep deprivation or determine another cause for your symptoms. One of the symptoms that is especially likely to result in a sleep deprivation diagnosis is daytime sleepiness. Other signs that your doctor may pay attention to include a prolonged period of poor sleep, falling asleep within a few minutes of lying down, falling asleep during inopportune times, or experiencing the “microsleeps” described in the “stages of sleep deprivation” section. Your doctor will ask you detailed questions about these symptoms and other factors that may be contributing to your fatigue. They may also ask you to develop a written sleep log so they can better understand your symptoms and contributing factors. The doctor may be able to dispense a diagnosis and treatment options on their own, or they may refer you to a sleep specialist. The sleep specialist may conduct further examinations to develop a better sense of your sleep deprivation, its underlying causes, and possible treatments. Allocating more time for sleep. The most direct way to treat sleep deprivation is to sleep more. In some cases, this may be as simple as scheduling a longer window for sleep each night in order to obtain an adequate number of restful hours. Addressing underlying conditions. If your sleep deprivation is the result of a condition such as insomnia, depression, sleep apnea, and so on, then addressing or trying to treat the root cause should assist in the management of sleep deprivation. Lifestyle changes. 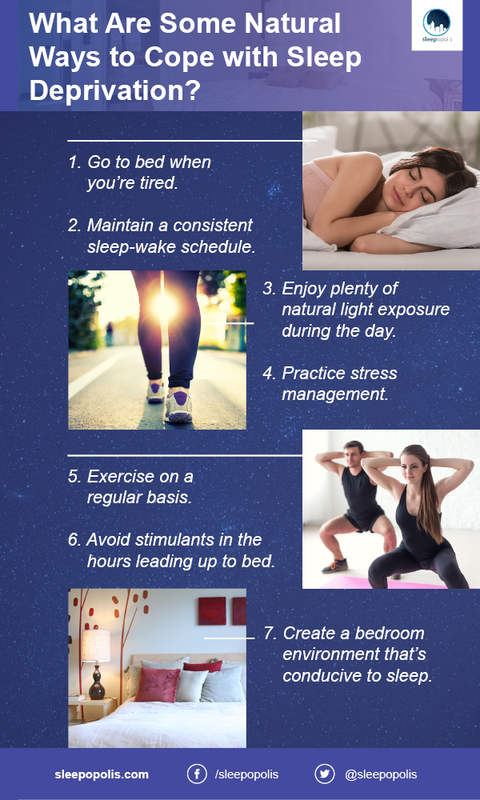 If your sleep deprivation is the result of lifestyle factors, then changing these factors may help you get more sleep. Effective lifestyle changes might include hiring a professional to assist with caretaking for a sick family member, changing your work schedule so it’s more conducive to sleep, cutting back on late-night activities such as partying or watching TV, and so on. Home care strategies. A number of natural, at-home strategies may help people cope with sleep deprivation. We’ll touch more on these strategies in the following section. Cognitive Behavioral Therapy (CBT). 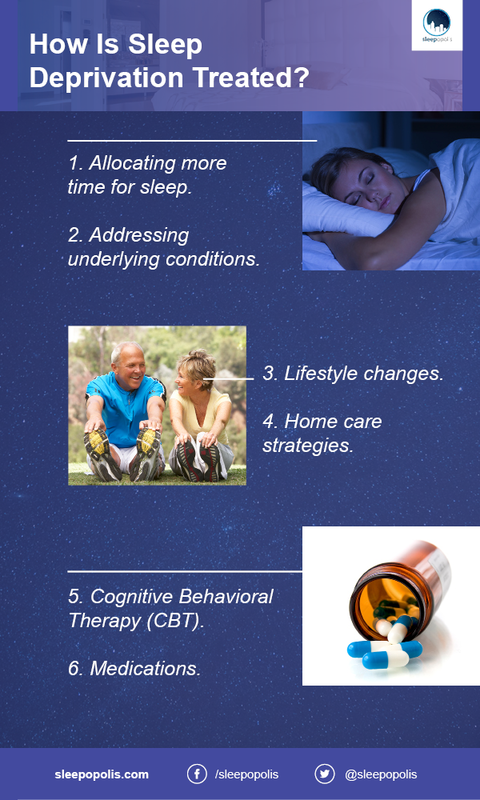 This popular type of therapy helps people get to the bottom of the behavioral habits or thought patterns that may be interfering with their ability to get adequate sleep and develop tools for changing these patterns. Medications. In some cases, your doctor or sleep specialist may recommend the use of over-the-counter or prescription sleep medication. These may range from herbal supplements (such as valerian root or melatonin) to drugs such as benzodiazepines or hypnotic sleeping pills. These drugs are likely to come with their own set of side effects and may cause dependencies, so it’s important to use them with caution and under the close supervision of a medical professional. What Are Some Natural Ways to Cope with Sleep Deprivation? Go to bed when you’re tired. That may seem pretty basic, but many of us push past tiredness in order to keep reading, watching TV, working, socializing, and so on. Try to practice getting in bed the minute you feel ready for sleep. Maintain a consistent sleep-wake schedule. Make sure this schedule allows plenty of room for you to sleep at least seven to eight hours each night. Keeping your bed and wake times consistent will train your body to fall asleep at the same time every night, which can help ensure your body clock lines up with a healthy sleep schedule. Enjoy plenty of natural light exposure during the day. Along with maintaining a consistent sleep-wake schedule, this is a great strategy for refining your body’s internal clock. Daytime exposure to sunlight helps ensure your circadian rhythms function properly, which encourages your body to fall asleep at an appropriate time each night. This, in turn, increases the likelihood that you’ll get plenty of sleep. Practice stress management. Relaxing the body can help people who suffer from anxiety, stress, or other medical or psychological conditions fall asleep more easily. For this reason, strategies such as deep breathing, meditation, or progressive muscle relaxation may help combat sleep deprivation. Other stress management techniques include doing yoga, playing an instrument, taking a bath, reading a calming book, or socializing with supportive people. Exercise on a regular basis. Not only does exercise serve as another stress management technique, but it also helps tire out the body. This, in turn, can make it easier to fall and stay asleep for a sufficient number of hours each night. For best results, aim for at least 20 to 30 minutes of physical activity every day. Try to avoid this activity in the hour or two before bed, because exercise has a temporary stimulant effect. Avoid stimulants in the hours leading up to bed. That means ditch the nicotine and caffeine. If you can’t go a day without coffee, try to limit your fix to the morning hours so the caffeine is out of your system prior to getting in bed. While you’re at it, go ahead and limit alcohol in the hours leading up to bed—even though it’s not a stimulant, it’s known to impair sleep quality. Create a bedroom environment that’s conducive to sleep. Keep the bedroom dark, quiet, and at a cool (yet still comfortable) temperature. If that means purchasing blackout curtains and noise-cancelling earplugs, it’s well worth the investment. Also avoid using electronics, working, or engaging in stressful conversations in bed. Avoid electronic devices in the hours leading up to bed. Electronic devices such as tablets, laptops, and smartphones all emit blue light, which can interfere with our bodies’ circadian rhythms. If you want to ensure blue light exposure doesn’t rob you of sleep, make a habit of avoiding mobile devices within a few hours of bedtime. Take a nap. Sometimes the fastest way to start catching up on lost sleep is to squeeze in a daytime nap. Just make sure you don’t nap for more than approximately 25 minutes at a time—while short naps can help increase alertness, longer naps may make you feel groggier than when you started. A reminder: This content is meant to be informative in nature, but it shouldn’t taken as medical advice, and it shouldn’t take the place of medical advice and supervision from a trained professional. If you feel you may be suffering from any sleep disorder or medical condition, please see your healthcare provider immediately. Sleep deprivation is not a sleep disorder, but it can still have serious ramifications for a person’s health and quality of life. If you feel that you’re sleep deprived, the best antidote is to get more sleep using some or all of the strategies outlined above. If that doesn’t cut it, then it may be time to consult a medical professional. Don’t give up until you’re getting adequate amounts of sleep on a regular basis; your well-being depends on it.